If you're looking to buy organic oils, this 35 lb. organic canola oil is the perfect choice. From cooking to baking, sauteing to stir-frying, this canola oil is great for all of your kitchen needs! Extracted from canola seeds, this organic canola oil has a clear, light color with a neutral taste. No extra heat or chemicals are used in the refining process, allowing the oil to retain its natural flavor and beneficial nutrients. Simply substitute this organic canola oil for butter or other oils in your cooking, and it's easy to make your menu offerings just a little bit healthier. Known for its low amount of saturated fat and high amount of healthy omega-3 and omega-6 fatty acids, canola oil contains the least saturated fat of all cooking oils. With so many uses and benefits, this organic canola oil is a must have ingredient for your kitchen! 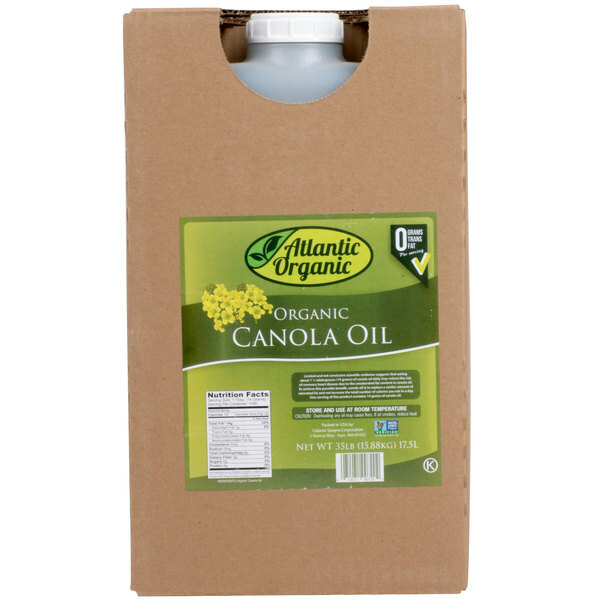 Overall User Rating: 100% Pure Organic Canola Oil - 35 lb. I love that webstaurantStore is starting to carry organic products! Quality ingredients are the now & future of the food industry. We market many organic products to our customers and it helps create a brand for your establishment, that is associated with quality and care. We use this oil in a lot of our products. I would highly recommend it! Great price too! After reading and learning about the harmful effects of regular canola oil, I researched online for the best deal for organic canola. WebstaurantStore is the best deal for your money. This oil is the healthiest cooking oil. 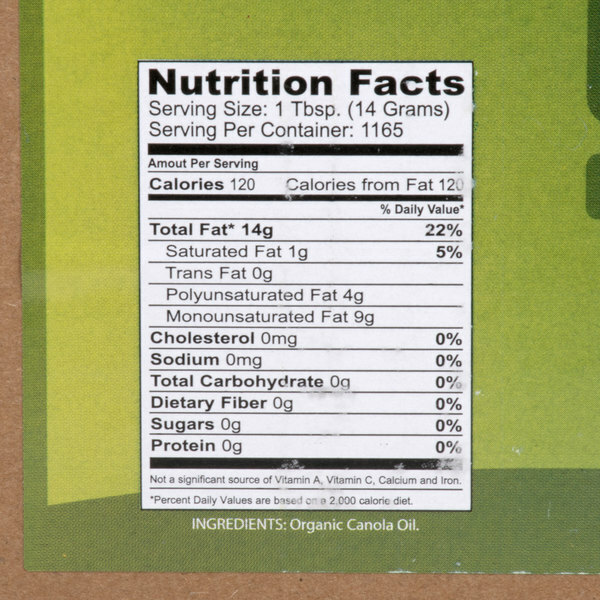 It is the cooking oil that is highest in omega 3's. Canola oil is higher than in omega 3's than ALL other oils. There is nothing negative about this oil. It is light, tasty, excellent for all types of cooking, including baking, and has a long shelf life. I searched the Internet and this was the best price I could find. It's wonderful that it is organic because that means there was no pesticides nor roundup used in its production nor is it GMO which all non-organic canola is GMO. These things have been linked to cancer and other diseases. Using oil that is organic is a great way to reduce these things in the diet since oil adds a major portion of these negative things to the diet. We have just started using this Canola oil for my family. We all agree that it is delicious & light without tasting too thick & oily like others we have used. This oil is able to be used @ a very high temperature also!, We appreciate the Organic products available ! Thank you Webstaurant ! 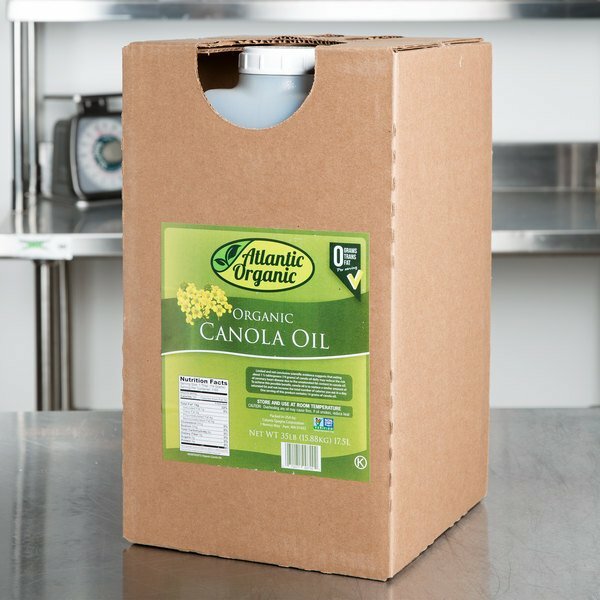 A nice quality pure organic canola oil that is perfect for frying foods. The oil is a great buy and has a nice heat point.